The Dark Ranger: Tweedle Dee and Tweedle Dumb! 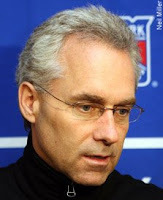 The Penguins shutout the NY Rangers the other night -- my fingers couldn't even write about it I was so upset; I still don't understand how the Blueshirts can play a game on the level of the Chicago Blackhawks win and turn around to become an AHL team against our rival Penguins. We haven't even had a good-loss this season -- "they played hard, but that was one hellava hockey game!" --- as fans we haven't said that once. Brendan Shanahan was never re-signed as a Ranger and half-way-through the season, the NJ Devils nab him. In his debut as a Devil last night he scores on the power play - "Fan-f**king-tastic!" Tonight against Anaheim, Petr Prucha is a scratch. Voros will replace him. Mistake. 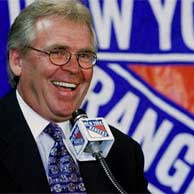 General Manager Glen Sather and Coach Tom Renney are spoiling the season for us all! Like the ancient Chinese water torture, our beloved Blueshirts will soon be letting it all go -- the sum of it's parts slowly deteriorating. Yes, It was a bitter sweet to see Shanahan score last night for the Devils. I kept hearing about how tired they might be from the 5 game road trip. Sorry it doesn't cut it with me. 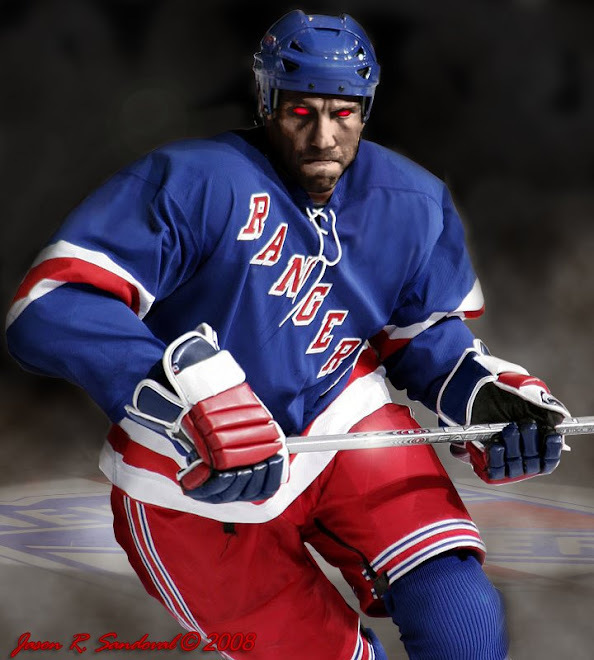 The Rangers got plenty of rest in between games and really didn't travel to the west coast to make that excuse. They simply got outplayed and outworked. No excuse needed. Let's hope for a big win tonight against Anaheim. I do agree with you on most of your points. However, the only time I can actually remember saying, "Wow! They really played well, but they lost, but jeeze it was a good game." was when they played in San Jose. They played a helluva a third period, probably the best ive seen them play this year, but they just couldn't pop a goal in the net. Sometimes I wonder why they can't play like that all the time and then I remember we have a knucklehead for a coach and then it all comes back to me. I'm just hoping we can make a trade to get this idiot Wade Redden out of here. Worst signing I've seen in a looooong time. Don't even get me started on Shanahnan. My plans to get a ticket and bring a big "Forgive Us Shanny" sign to the next game have been put on hold till I can find a way to make a sign big enough without causing a paper shortage.